This race was the payback; he passed Lewis Hamilton for the lead and the win, which doesn’t happen every day. But equally impressive is the way he held off Bottas at the start. Before the race, I went round the grid slots assessing how damp the track surface was. Hamilton’s slot was quite dry (the Mercedes mechanics saw to that early on) and so was Bottas’. Both Red Bull drivers and Raikkonen had dampness on the grid slot. There was some confusion about whether mechanics are allowed to dry them or not. The FIA stewards on hand said it had been allowed towards the end of last season by Charlie Whiting so…. Bottas’s grid slot was directly behind Verstappen and diagonally behind Ricciardo. 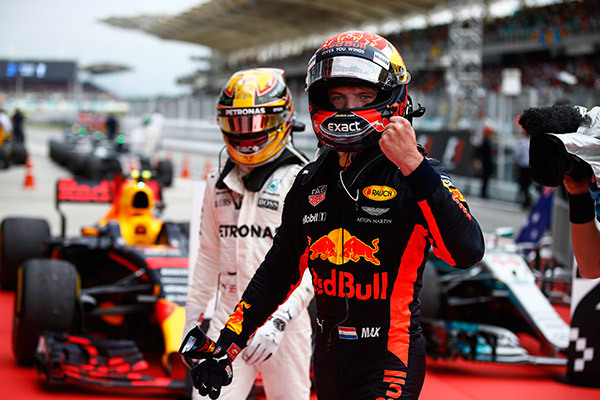 He got a better launch and went for the outside line, giving him a run on Verstappen, but the way the 20 year old resisted and came out ahead after a duel lasting several corners was impressive. It was a great win, on a day when Ferrari had problems and the Mercedes were not on form. But if you compare this Red Bull Renault package now with the problem package they had in Melbourne, the improvement is incredible and I suspect they may have more chances. The forecast for Suzuka is bad and this is the best wet weather car in the field. 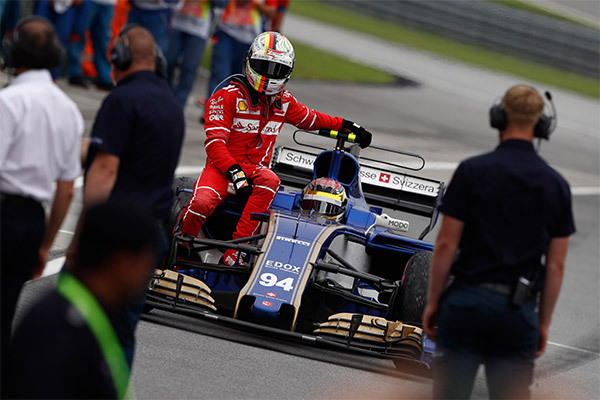 The Malaysian GP was another race in which Ferrari failed to capitalise on a clear pace advantage over Mercedes. In Singapore it was the fault of the drivers; in Malaysia the power unit let the side down. Not only did Vettel have to start from the back of the grid after an issue in qualifying, when pole was there for the taking, but Raikkonen failed to start the race due to an issue on the grid. Given the pace Ferrari had this weekend either man could have easily won the race, but in the end, neither did and Hamilton extended his lead in the drivers’ championship. Only a non-finish in one of the remaining five races will deny Hamilton his fourth title now. Vettel's climb through the field to fourth shows the pace the car had. On a reverse strategy he was very quick and would have troubled the podium had he not lost so much time early on behind Alonso. Later in the race he lapped his old adversary, who cost him more time as he was just about to attack Ricciardo. To say Vettel was disappointed by Alonso there would be an understatement. Mercedes were down after the race and the debrief went on an hour longer than scheduled, as they sought to understand why the car did the same thing as in Bahrain in April. On a hot track with certain types of corner the car slides, overheads the surface of the tyre (especially the supersoft) and that destroys the grip. It wasn’t a problem in qualifying because that took place at 1700 local time, when it was cooler. The race was 1500 and heat was a problem. 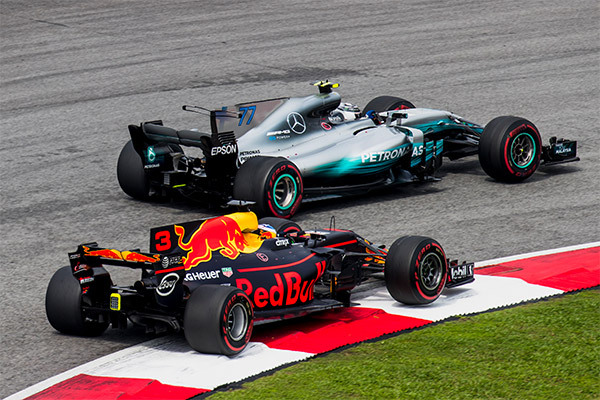 As in Bahrain, Hamilton could drive around it, Bottas couldn’t and his post race press briefing was a real ‘mea culpa’ – he was talking about this being the biggest struggle of his career because he’s not competing with the others despite being in a Mercedes. He talked about F1 being a psychological game and how he is on the wrong side of things at the moment. It was amazing. 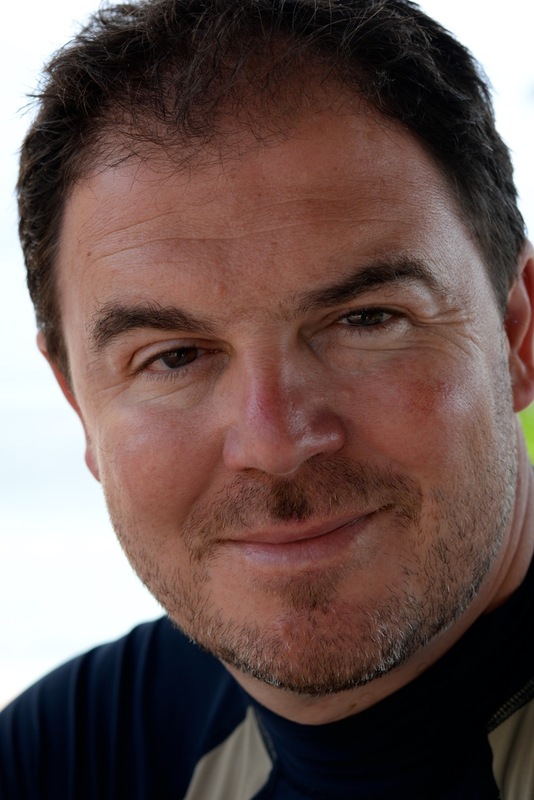 Toto Wolff is keeping the faith, saying that sailing on smooth waters doesn’t make a great sailor. But one could argue that as a Mercedes driver, with several years apprecticeship at Williams behind him, he should have done his Sailor training and now be the complete article. Many people have observed how it makes them realise how underrated Nico Rosberg was. I'm personally sad that this is the last Malaysian GP, possibly ever. The Prime Minister made some noises today about the door being open for a return and the crowd certainly turned out for the send off. But it's not been a successful race commercially for many years and so the locals have pulled the plug. F1 needs a new Asian venue. I love the country, the people and the vibe of Malaysia. 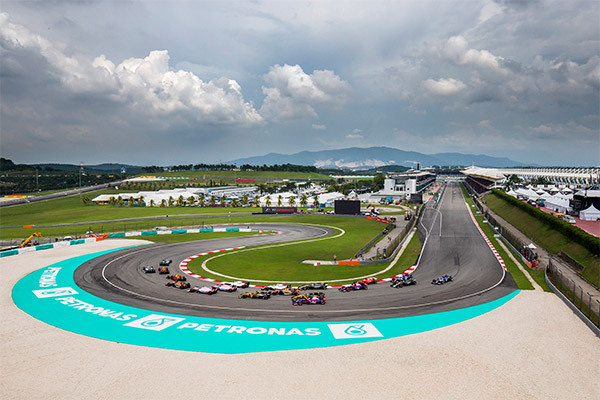 It added something to the world championship, it was a very good track (one of Tilke's first) and I've attended all 19 Malaysian GPs. I remember the first one, when I was with ITV in 1999 and Schumacher made his comeback from a broken leg to hand the win to team mate Irvine. Ross Brawn explained to us afterwards about the bargeboards in a steaming hot team office. But the 2001 event is the classic, with the monsoon early on. F1 showed the whole thing on F1.com this weekend with the commentary of Murray Walker, Martin Brundle and myself.